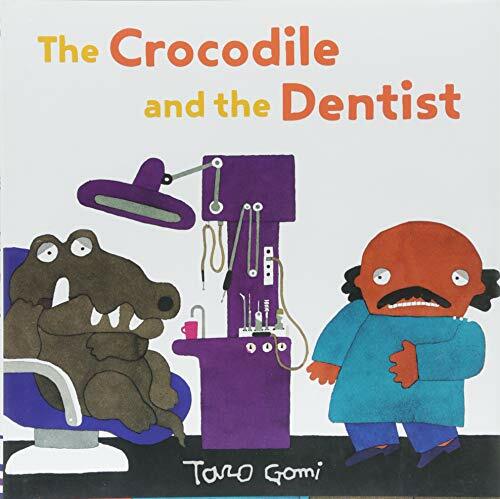 This colorful book, The Crocodile and the Dentist, has only 128 words in it, and many of them are repeated. First the crocodile says he is afraid. Then the dentist repeats it. Neither one of them wants to meet, but Crocodile has a toothache, and the dentist needs to work. The story is reminiscent of William Steig’s book, Dr. DeSoto, where the dentist is a mouse, and the patient is a fox. They, too, were scared of one another when the book was first published in 1982. The Crocodile and the Dentist has two sides to it, how the crocodile is afraid of pain with his sore tooth, and how the dentist is afraid of pain from all those crocodile teeth. In this story, the dentist is a human, but for some reason he will do work on an animal. One of the best spreads is where they meet and are both having the same reaction. “Ah!” says the crocodile, his teeth showing. “Ah!” says the dentist, while holding his drill and pliers. From there on, the crocodile says a line, and the dentist echoes the line. Each spread shows the dentist working on the sore tooth, first with a drill, then a sharp tool, then some filling, until the dentist is done and the crocodile is relieved. What dentist wouldn’t want this book in his or her waiting room? Wait! Maybe it’s a book to read after the filling is filled, not before, There are too many ouches and references to pain for a skittish patient. The end papers are cleverly done in pink toothbrushes with white bristles on a navy background. The art is simple and somewhat primitive with big bold colors and lots of white space. The eyes are expressive and changing but also matching in the two characters from spread to spread. The story certainly tells both sides of this interaction, which is what makes the book work. Readers can fell empathy for the crocodile patient and the human dentist. The book seems so simple, but it is a whole episode of being afraid, going to the dentist, being brave, and getting done what needs to be done. It is trusting another, and also being wary. It is success at an unpleasant task, told from two perspectives. Every library needs a copy. To all the kids and crocodiles out there: happy brushing!